This cute dress with a circular skirt is one that can be worn for all kinds of occasions as the warm days of summer melt into the cooler days of autumn. 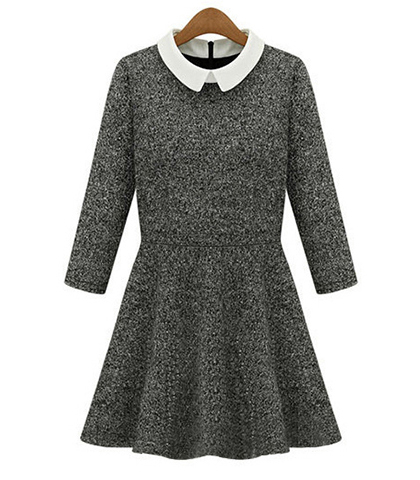 It is presented in your choice of dark gray or black and features a rounded white collar. The sleeves are three quarter length and snugly fitted. The bodice is cut close to the body, and the waistband well defined. The skirt portion of this dress is short and flared. Its circular cut imparts a nice sense of balance to the dress. The hemline is very short, ending well above the knee. We recommend dry cleaning only for this dress. It is available in sizes Small, Medium, Large and Extra Large.